Dunluce Castle is in the care of the Northern Ireland Environment Agency. It is a Monument in State Care sited in the townland of Dunluce, in Coleraine Borough Council area, at grid ref: C9048 4137. The earthworks, adjacent to Dunluce Castle, are a Scheduled Historic Monument, at grid ref: area of C905 412. In the 13th century, Richard Óg de Burgh, 2nd Earl of Ulster, built the first castle at Dunluce. It is first documented in the hands of the McQuillan family in 1513. The earliest features of the castle are two large drum towers about 9 metres (30 ft) in diameter on the eastern side, both relics of a stronghold built here by the McQuillans after they became lords of the Route. The McQuillans were the Lords of Route from the late 13th century until they were displaced by the MacDonnell after losing two major battles against them during the mid- and late-16th century. Later Dunluce Castle became the home of the chief of the Clan MacDonnell of Antrim and the Clan MacDonald of Dunnyveg from Scotland. Chief John Mor MacDonald was the second son of Good John of Islay, Lord of the Isles, 6th chief of Clan Donald in Scotland. John Mor MacDonald l was born through John of Islay's second marriage to Princess Margaret Stewart, daughter of King Robert II of Scotland. In 1584, on the death of James MacDonald the 6th chief of the Clan MacDonald of Antrim and Dunnyveg, the Antrim Glens were seized by Sorley Boy MacDonnell, one of his younger brothers. Sorley Boy took the castle, keeping it for himself and improving it in the Scottish style. Sorley Boy swore allegiance to Queen Elizabeth I and his son Randal was made 1st Earl of Antrim by King James I. Four years later, the Girona, a galleass from the Spanish Armada, was wrecked in a storm on the rocks nearby. The cannons from the ship were installed in the gatehouses and the rest of the cargo sold, the funds being used to restore the castle. MacDonnell's granddaughter Rose was born in the castle in 1613. A local legend states that at one point, part of the kitchen next to the cliff face collapsed into the sea, after which the wife of the owner refused to live in the castle any longer. According to a legend, when the kitchen fell into the sea, only a kitchen boy survived, as he was sitting in the corner of the kitchen which did not collapse. However, the kitchen is still intact and next to the manor house. You can still see the oven, fireplace and entry ways into it. It wasn't until some time in the 18th century that the north wall of the residence building collapsed into the sea. The east, west and south walls still stand. In 2011, major archaeological excavations found significant remains of the "lost town of Dunluce", which was razed to the ground in the Irish uprising of 1641. Lying adjacent to Dunluce Castle, the town was built around 1608 by Randall MacDonnell, the first Earl of Antrim, and pre-dates the official Plantation of Ulster. It may have contained the most revolutionary housing in Europe when it was built in the early 17th century, including indoor toilets which had only started to be introduced around Europe at the time, and a complex street network based on a grid system. 95% of the town is still to be discovered. The castle inspired the orchestral tone poem Dunluce (1921) by Irish composer Norman Hay. Dunluce Castle is thought to be the inspiration for Cair Paravel in C. S. Lewis's Chronicles of Narnia (1950–54). Ron Moody menaced Jack Wild and Helen Raye at Dunluce Castle in Flight of the Doves, a 1971 film. In 1973 the castle appeared on the inner gatefold of the multi-million selling Led Zeppelin album Houses of the Holy. On the 1984 Gary Moore video "Emerald Aisles" on his return to Northern Ireland, he visits the castle and talks about the history of the castle. Cassette and CD versions of Gary Moore's 1989 album After the War feature an instrumental track titled "Dunluce" in one and two parts respectively. The castle is also the subject of a 1990s song named "Dunluce Castle" written by George Millar and sung by the Irish Rovers. The castle is mentioned and appears briefly in Michael Palin's 1994 episode of Great Railway Journeys, Derry to Kerry. The castle appeared as Snakehead's hideout under the name 'Ravens Keep' in the 2003 movie, The Medallion, which starred Jackie Chan. It is also featured on the cover of the album Glasgow Friday (2008) by American musician Jandek. The castle is the film location of the Game of Thrones Seat of House Greyjoy, the great castle of Pyke. The Belfast-Derry railway line run by Northern Ireland Railways connects to Coleraine and along the branch line to Portrush. Local Ulsterbus provide connections to the railway stations. There is a scenic walk from Portrush alongside Dunluce Castle and Giant's Causeway and Bushmills Railway in Bushmills. 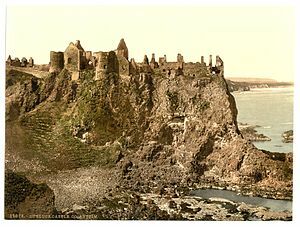 ^ Guide to Dunluce Castle in Ulster-Scots Archived 3 September 2012 at the Wayback Machine DOE. ^ from the Northern Ireland Tourist Board Discover Northern Ireland website. ^ "Dunluce Castle" (PDF). Environment and Heritage Service NI — State Care Historic Monuments. Retrieved 3 December 2007. ^ "Dunluce" (PDF). Environment and Heritage Service NI — Scheduled Historic Monuments. Archived from the original (PDF) on 5 November 2008. Retrieved 3 December 2007. Charles Johnston (1902). "Ireland, Historic and Picturesque". Project Gutenberg. Breen, Colin (2012). Dunluce Castle : archaeology and history. Dublin: Four Courts Press. ISBN 9781846823312. Wikimedia Commons has media related to Dunluce Castle. from the Northern Ireland Tourist Board Discover Northern Ireland website.